I took this photo in Mendon, MI. This sign sits in the front yard of someone's house. 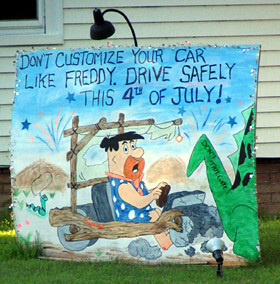 It reads "Don't customize your car like Freddy. Drive Safely this 4th of July!" Obviously the image depicts Fred rear-ending a dinosaur. The dinosaur's tail reads "Don't tailgate"
I've talked to other people who live in Mendon who've seen the sign. They too have no clue what this is all about. I guess someone is truly passionate about tailgating prevention? Strange. You're living in some strange pocket-o-weird. Dead bodies, aliens in windows, dogs guarded by owners with shotguns. Wow. Let me get alil' of that. Bytheway, is this lovely Flintstones' piece another stage of this guy's experiment in reducing property value? You ain't kidding about a pocket of weird. For about two months straight I felt like I couldn't go anywhere without seeing something bizarre. Unfortunately that all came to a stop around the time I took the photo of the deer heads. If you want alil' of that weirdness take yourself a trip to Three Rivers and Mendon. Both places seem to be a haven of weirdness. The Flintstone piece belongs to someone else but it's definitely meant to drive down property values.